Much more than just a caravan park! We look forward to welcoming you! Then rate us on TRIP ADVISOR!!! You can find us under the Broken Head Holiday Park. We'd love to hear your feedback! Arakwal National Park Surrounds Our Beautiful Park! 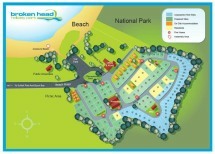 Situated on the beachfront of Broken Head just seven kilometres south of Byron Bay, Broken Head Holiday Park is surrounded by national park and stunning views north towards Byron Bay and south towards Ballina. A stroll through the reserve track offers unbeatable views of rock formations and the Pacific Ocean. The park is perfect for a quiet laidback holiday.